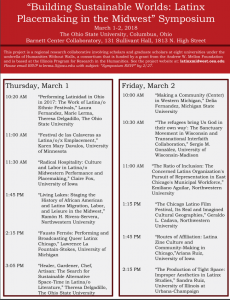 On March 1-2, 2018, thirteen researchers of the “Building Sustainable Worlds: Latinx Placemaking in the Midwest” project came together in Columbus, Ohio, to present and discuss their research. Talks focused on Latinx community-making and creation of space. For more information, click here or on the flyer below.